Economic slavery, or wage slavery, refers to one's total and immediate dependence on wages to survive. Although people throughout history have had to work to get by, we now live in a culture where we are led to believe we have economic freedom, when unbeknownst to most citizens, we are in fact bound in servitude. We automatically accept a 40-hour workweek with meager hourly pay as normal, even though many work overtime and still struggle to survive. There are also those who make enough to live comfortably but are unable to request less hours—you either work 40 hours a week, or you don't get to work at all. We submit when told what to wear, when we have to arrive and depart, when we're allowed to eat, and even when we're allowed to use the restroom. How is it we have come to allow this? 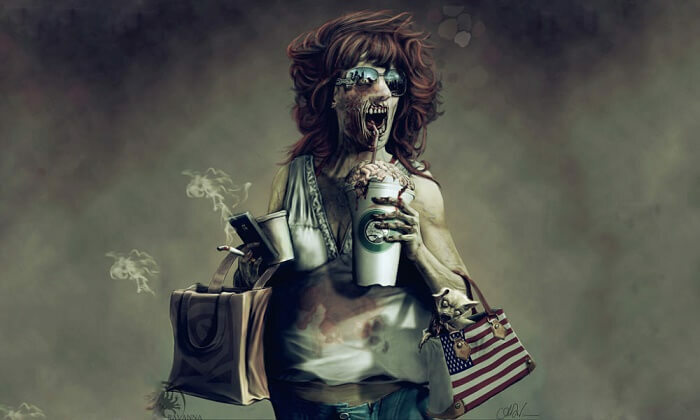 There are many contributing factors that have led to our current economic system and continued acceptance of the 40-hour workweek, three major factors being consumerism, inflation, and debt. First, it's important to understand exactly what inflation is, how it works, and how it leads to debt. To put inflation simply, let's say the U.S. government needs money for whatever war they've decided to wage this year. They ask the Federal Reserve for a loan, and the Fed agrees to buy bonds (sort of like IOU's) from the government in the amount of the requested loan. The U.S. government then prints up a bunch of pieces of paper that say “Treasury Bond” while at the same time, the Federal Reserve prints up a bunch of little pieces of paper that we know as money. A trade is made between the government and the Federal Reserve—the bonds for the money—and the U.S. government directly deposits this newly printed money in a different bank, which in turn, takes its cut in fees and interest. Voilà, money has been created out of thin air. 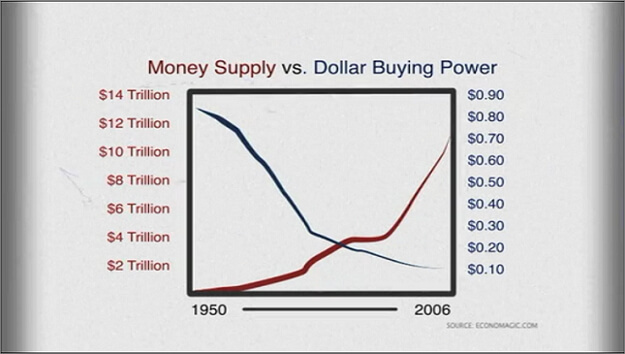 Although this process takes place electronically now (only 3% of money is in physical form, the other 97% exists in computers) the problem either way is that it depletes the worth of the dollar. At one point in time, currency was worth gold. That was what gave money its value, but now the value of money is trusted to the Federal Reserve who has no moral objections to reducing that value by printing more money (basically legal counterfeit). For the cost of printing, the Federal Reserve creates money that the U.S. government has promised to pay back—money that didn't even exist in the first place. It works like this with private bank loans to citizens as well. Each time a transaction of this sort happens, it reduces the value of actual currency, and thus we have inflation. One dollar in 1913 required $21.60 in 2007 to match its value. That's a 96% devaluation since the Federal Reserve came into existence. How does this lead to economic slavery? By the debt inflation has caused. Since money is created through loans, that means it's created through debt. Money equals debt, and debt equals money. So the more money there is, the more debt there is, and vice versa. What this means is, if somehow the government and every citizen in debt were able to pay back those loans, there would not be a single dollar in circulation. Interest plays an important role in this equation as well. When you take out a loan and the bank gives you money that technically doesn't exist, they also expect you to pay additional interest with it. If the money loaned is coming from the Federal Reserve, where is the money for the interest supposed to come from? That means no matter what, the nation will never be able to get out of debt, and that is exactly the purpose of this meticulously orchestrated system. Like a toss of the coin, somebody somewhere will always go bankrupt to make up for the interest that is being paid with even more debt. And so, as the nation sinks further in the hole while the cost of living increases, surviving in the economy becomes more difficult. This desperation to survive, coupled with the fact that we were born into this system, is ultimately what causes us to accept the 40-hour workweek without a moment's thought. So now we understand the element that forces us to accept our predicament, but how does the 40-hour workweek benefit banks and corporations? After all, studies show that the average office worker gets less than three hours worth of work done in an 8-hour work shift, and according to reports, US corporate profits are soaring while wages are declining. Bureau of Labor Statistics figures show that productivity has increased at a 2.3 percent annual rate in the third quarter, while hourly pay only increased 1.3 percent in the third quarter, and this has been the basic pattern for some time—it adds up after a while. Corporate profits are at their highest level in at least 85 years, so why aren't we being paid more, working less, and providing additional jobs to those who need them? This brings us to consumerism. “Charge it!” – Credit cards were first promoted through the Diners Club—a charge card company that services affluent and well-traveled individuals from around the world. Other companies followed suit and started advertising credit cards as a “time-saving device” rather than a way to spend money that wasn't actually there. “Bigger is better” – During the 1970's, companies began to send credit cards out by the masses to those who had not requested them. While Americans had already been developing the idea that “bigger is better”, the credit card boom ended up exploiting that idea. Now people had the means to obtain extravagant items they couldn't before, even though it put many in colossal debt. Congress soon had to regulate the credit card boom, and ban sending cards to those who never requested them in the first place. Companies in all kinds of industries hold a huge stake in the public's penchant to be careless with their money, and they encourage this habit of casual or non-essential spending when they can. For example, in the documentary The Corporation, a marketing psychologist discussed a method she used to increase sales that involved encouraging children to nag their parents to buy toys. Studies showed that 20% to 40% of purchases of this sort resulted after children nagged their parents. “You can manipulate consumers into wanting, and therefore buying, your products. It's a game.” Lucy Hughes, co-creator of “The Nag Factor”. The 40-hour workweek is the ultimate tool for corporations to sustain this culture of over-indulgent spending. Under our current working conditions, people are forced to build a life in the evenings and their days-off. We find ourselves more inclined to spend heavily on entertainment and conveniences because we rarely have any free time. When we do have time to ourselves, it's usually fleeting, and we eventually find ourselves neglecting those activities which are free—walking, exercising, reading, meditating, sports, hobbies, etc.—because they take too much time. While having extra money comes at the sacrifice of personal time for some, for others they not only are robbed of their personal freedom, but they struggle to make ends meet on top of it. The “perfect” consumer works full-time, earns a fair amount of money, indulges during their free time, and somehow just makes it by each month. However, even those who don't earn fair wages sometimes find themselves wasting small increments of money on unnecessary items for the wrong reasons—a cup of Starbucks here, a McDonald's cheeseburger there, and those really cool fuzzy dice hanging from the rear-view of your 1993 Honda Civic. Any way you look at it, we have become an unhappy, mindless, over-worked society. We buy silly items for a few moments of happiness before getting bored and moving on. We feel a need to keep up with fads, or to fulfill our childhood vision of what adulthood would be like. We hide our insecurities, avoid issues, and replace psychological needs with material items. By keeping society's free time scarce, people will pay more for convenience, gratification, and any other relief they can buy.